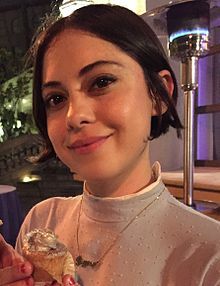 Rosa Bianca Salazar (/ˈsæləzɑːr/; born July 16, 1985) is an American actress. She had roles in the NBC series Parenthood and the FX anthology series American Horror Story: Murder House. She played the titular character in the film Alita: Battle Angel. She has appeared in The Divergent Series: Insurgent, Maze Runner: The Scorch Trials and Maze Runner: The Death Cure and has also appeared in the Netflix films The Kindergarten Teacher and Bird Box. Rosa Bianca Salazar was born on July 16, 1985. She is of Peruvian descent. She attended Eleanor Roosevelt High School in Greenbelt, MD and was very active in the school theatre program. This article is about the American actress. For the Mexican actress and screenwriter, see Rosa Salazar Arenas. Rosa Bianca Salazar (/ˈsæləzɑːr/; born July 16, 1985) is an American actress. She had roles in the NBC series Parenthood and the FX anthology series American Horror Story: Murder House. She played the titular character in the film Alita: Battle Angel. She has appeared in The Divergent Series: Insurgent, Maze Runner: The Scorch Trials and Maze Runner: The Death Cure and has also appeared in the Netflix films The Kindergarten Teacher and Bird Box. Rosa Bianca Salazar was born on July 16, 1985. She is of Peruvian descent. She attended Eleanor Roosevelt High School in Greenbelt, MD and was very active in the school theatre program. 2011 Law & Order: LA Yolanda Episode: "Zuma Canyon"
2012 Ben and Kate Molly Episode: "21st Birthday"
Episode: "Birth Control on the Bottom"
2013 Hello Ladies Heaven Episode: "Pool Party"
2013 Body of Proof Ramona Delgado Episode: "Eye for an Eye"
2015 China, IL Barb (voice) Episode: "Magical Pet"
2015 Tim & Eric's Bedtime Stories Lucy Episode: "Tornado"
2016 Comedy Bang! Bang! Camper Episode: "Gillian Jacobs Wears a Gray Checkered Suit and a Red Bow Tie"
↑ "Rosa Salazar Wiki - Net Worth, Dating, Boyfriend, Bio, Height, Age". Ranked Wiki. 2018-11-20. Retrieved 2018-12-03. ↑ "Rosa Salazar: From "Abbreviated" 'Bird Box' Role to James Cameron's 'Alita'". The Hollywood Reporter. January 11, 2019. ↑ "Yes, That Was Rosa!" (PDF). Greenbelt News Review. October 6, 2011. ↑ Ross Carey (November 30, 2011). "Episode 53: Featuring Rosa Salazar". Conversations with Ross (Podcast). Retrieved February 25, 2012. ↑ "Rosa Salazar Joins 'Insurgent' (Exclusive)". The Hollywood Reporter. September 30, 2014. ↑ "Rosa Salazar Nabs Key Female Role in 'Maze Runner' Sequel (Exclusive)". The Hollywood Reporter. September 30, 2014. ↑ "China, IL's Musical Season Finale: We Talk to Brad Neely and Daniel Weidenfeld".